There are different views on carving a turkey. The cooking method – be it smoked, roasted, or rotisserie barbecued – shouldn’t be a factor. Some slice right off the breast of the bird while other chefs (like Bobby Flay) prefer a bit more sophisticated method and presentation. Watch as Hilton Head’s Palmetto Bay Sunrise Cafe owner Paul Stewart demonstrates how to trim your bird while considering the texture of the grain of the breast meat. 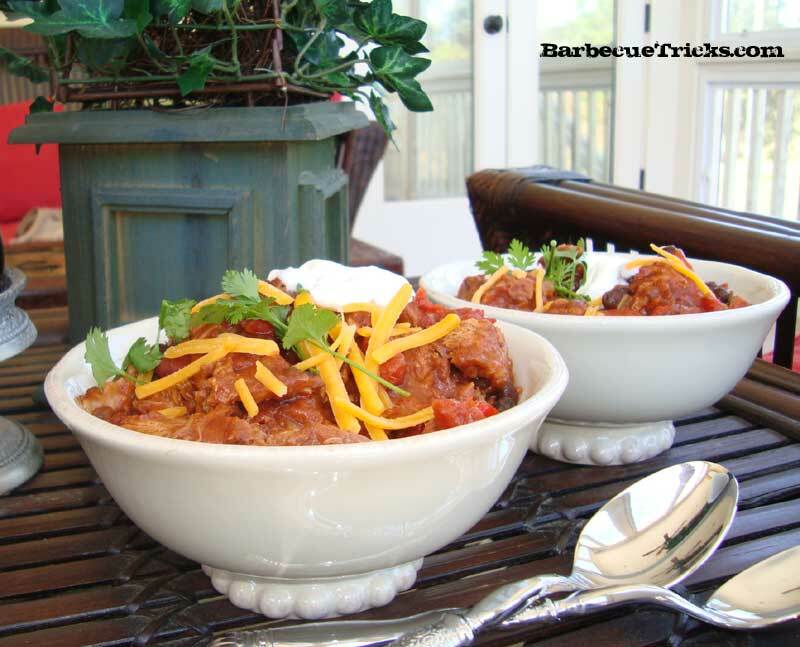 Love a good Chili Cook-off? This was a last minute – rush to slap together – concoction that just happened to be a crowd pleaser! 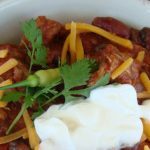 Unfortunately, it didn’t win with the judges in the office cook-off … but out of eleven other entries I heard some unsolicited (it was a blind judging) raves for it’s traditional chili taste and it’s hearty barbecue meatiness. The winning chili was fantastic but was fairly eclectic with red wine and venison. In a last minute / night before frenzy I decided to use a leftover pork tenderloin as the meat of choice. It worked great… but feel free to substitute something a bit less expensive (like pork shoulder). The lean tenderloin did however make for a low fat and overall healthy and hearty bowl of comfort. Third place was still a favorite. Brown cooked pork in oiled skillet. Add onions and garlic and cook until transparent. Transfer to deep pot or crock pot, add the rest of the ingredients and simmer. Add up to a cup of water for preferred consistency. Serves 10 to 20. You don’t have to be a grilling pro to cook like one. So many recipes on the grill only call for a few things to make them phenomenal: fresh ingredients, the right seasoning, and proper cooking time. Just three little things to remember and your food will surprise everyone. One of the most versatile foods in the entire world is chicken. This fine feathered friend of ours has been prepared thousands of ways over hundreds of years. 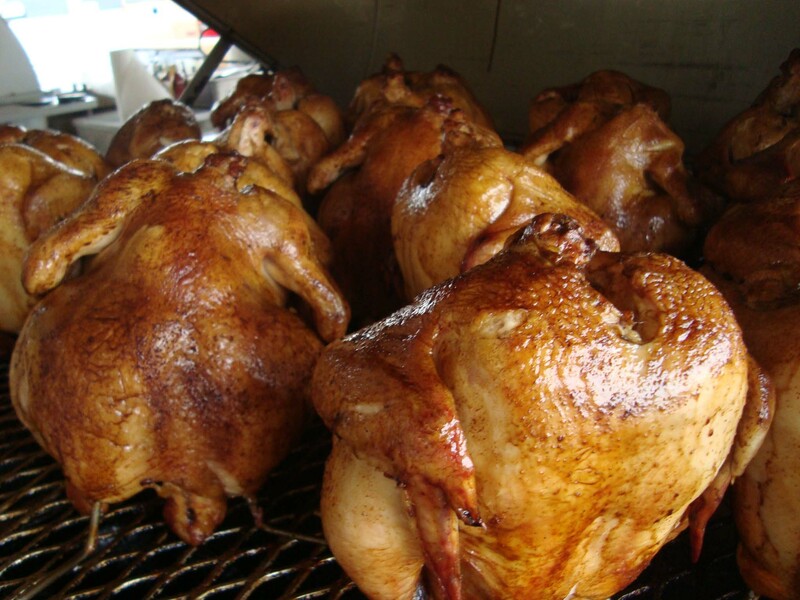 One of America’s favorite ways to eat chicken is barbequed. It’s so simple and delicious, yet people tend to get the formula wrong and their chicken comes out tasting like rubber smothered in ketchup. The first thing people do wrong is overcook the chicken. They leave the poor little pieces of chicken on the grill for hours until there’s nothing left but dehydrated meat and bone. You want to cook your chicken only to 170 degrees, never more. The idea is to let the chicken rest. Carryover heat will increase the temperature to 180 degrees, the safe point at which you can eat chicken. Chicken will remain juicy as long as it’s not overcooked. Don’t worry about drying it out. As long as it cook it the proper length of time, it will be just fine. This BBQ chicken recipe is really simple and super delicious. The first thing we’ll want to do is to go shopping. I personally like chicken thighs for this recipe, but you can choose what you wish. Make sure to grab a bottle of your favorite BBQ sauce. The trick here is in the seasoning, we won’t need to make a fancy sauce for these. The seasoning consists of salt and pepper, garlic powder, onion powder, paprika, rep pepper, and some old bay seasoning. Whatever you don’t have already, pick some up. We want to start the night before you grill and begin to season the chicken. We’ll need to make a quick spice rub. To do this, take two tablespoons of salt and black pepper, 1 tablespoon of garlic powder, onion powder, paprika and old bay, and a ½ teaspoon of red pepper. Combine all these ingredients in a bag or a container, and that’s it. Wash the chicken pieces and let dry thoroughly. After they’re completely dry, rub the chicken liberally with the seasoning. Wrap your chicken in foil or plastic wrap, place in a leak-proof container, and let it sit overnight. Be careful to never cross contaminate when dealing with raw poultry. On the day you’re ready to grill, cut your burners on medium heat. After your grill heats up, oil the racks well and place your chicken pieces skin side down. Once they start to cook, close the lid. Check on them every 5 minutes or so to make sure they’re not burning. All together, we want to give them 15 minutes on the skin side. After that, turn over and repeat the checking and waiting process. Let them go for another 15 minutes and them begin to sauce your chicken. Saucing is the last step. Make sure you keep a close eye on your chicken, the BBQ sauce will burn quickly due to its high sugar content. After you finish saucing one side of the chicken and turning it over, the pieces should be ready to turn back over after saucing the opposite side. They should only take about 3 minutes on each side to cook the sauce on. Be careful taking the chicken pieces off of the grill. This recipe is really simple. It’s all in the seasoning. These seasonings play very well with chicken, especially BBQ. The paprika has a nice, deep smoky taste. This recipe will be a hit with even the toughest crowds.